Central govt. has announced to launch Pradhan Mantri Kisan Samman Nidhi Yojana 2019 for farmers. Under this Farmers Income Support Scheme, govt. will provide Rs. 6000 per annum to small and marginal farmers with land holding upto 2 hectares. PM Kisan Scheme 2019 is a major step forward towards the welfare of farmers and will assure them of minimum income. The assistance amount would be transferred directly into the bank accounts of the farmers. PM Kisan Samman Nidhi Form will be available at pmkisan.nic.in to apply online. PM Kisan Samman Nidhi Scheme 2019 (PM-KISAN) would be fully funded by the central government and is expected to cost around Rs. 75,000 crore per year. PM Kisan Scheme 2019 is going to tackle the problem of the farmers and would also reduce the agarian distress. Online registrations for PM Kisan Scheme are expected to start at pmkisan.nic.in which is the official portal for PM Kisan Yojana. With this PM-KISAN Scheme for farmers, the govt. aims to assure minimum income guarantee to the farmers. Accordingly, farmers can utilize this direct cash transfer amount to buy anything of their choice. All the small and marginal farmers will get Rs. 6,000 per year. Only those farmers whose land holdings are less than 2 hectare (5 acre) can avail benefits of PM Kisan Scheme 2019. The assistance amount would be given through direct cash transfer and would be credited directly into the bank accounts of the farmers. Central govt. will give this PM Kisan Samman Nidhi amount in a single year in 3 equal installments of Rs. 2,000 each. PM Farmers Income Support Scheme will be fully funded by the central government and it will add a burden of around Rs. 75,000 crore on the government’s pocket. 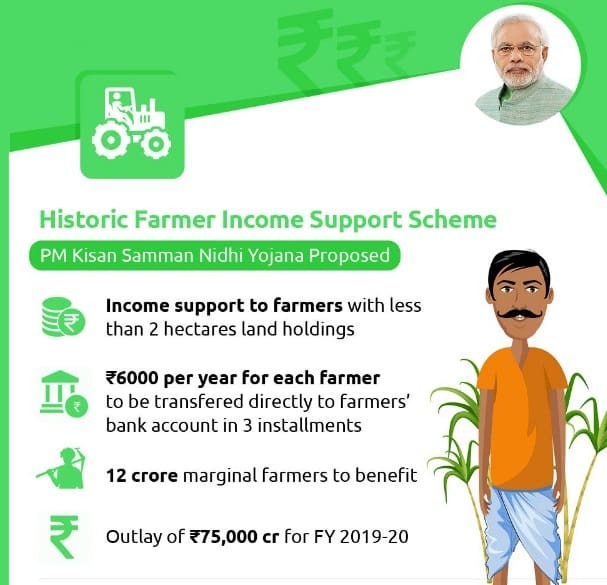 PM Kisan Samman Nidhi Yojana 2019 is going to benefit around 12 crore small and marginal farmers. 1st installment under PM-KISAN Scheme 2019 will be credit through DBT mode before the 31st date of the next month. PM Kisan Samman Nidhi Yojana 2019 will remain applicable from 1 December 2018. The central govt. also announced relief to farmers who are affected by natural disasters and rewards for those farmers who are repaying their loans on time. Instead of rescheduling of crop loans, farmers who are severely affected by natural calamities will now get 2% interest subvention and additional 3% interest subsidy on timely repayment. Here candidates can enter their details and click at the “Submit” button to apply online for PM Kisan Samman Nidhi Scheme 2019. Now in Telangana, farmers will get Rs. 14,000 per year as combination of Rythu Bandhu (8000 p.a) + PM Kisan Scheme (Rs. 6000 p.a). Accordingly, farmers in Odisha would get Rs. 16,000 per year as combination of Kalia Yojana (Rs. 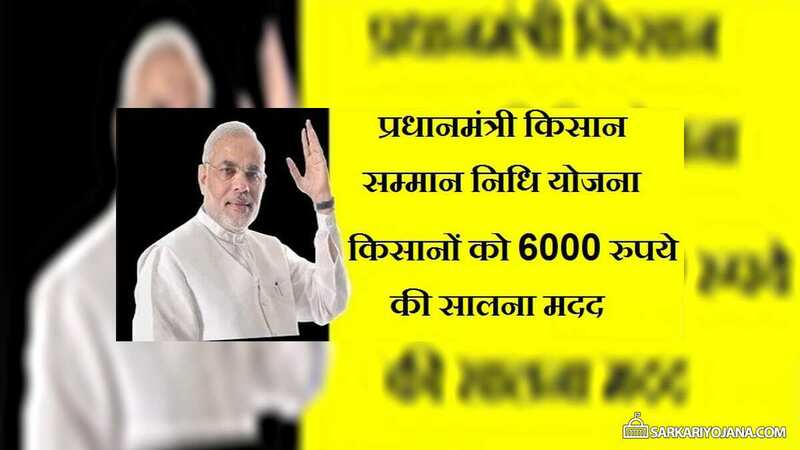 10000 p.a) + PM-KISAN Scheme (Rs. 6000 p.a). Now the central govt. will provide 2% rebate on loans taken from Kisan Credit Card. Moreover, all those farmers who pays their installments on time will get another rebate of 3% on KCC loans. I am sunildas lachchhakhedi my father is a poor farmer and my family is poor please ricvest .. Thanks for this. Most of farmers does not know how to apply for this scheme. So where can supposed to apply, pls tell me. Thanks for running this scheme,mostly person say that bjp is the party of Thakur. Can common man also get advantage from this scheme?I appreciate this scheme for farmers.